Now on Blu-ray from MVD Visual! 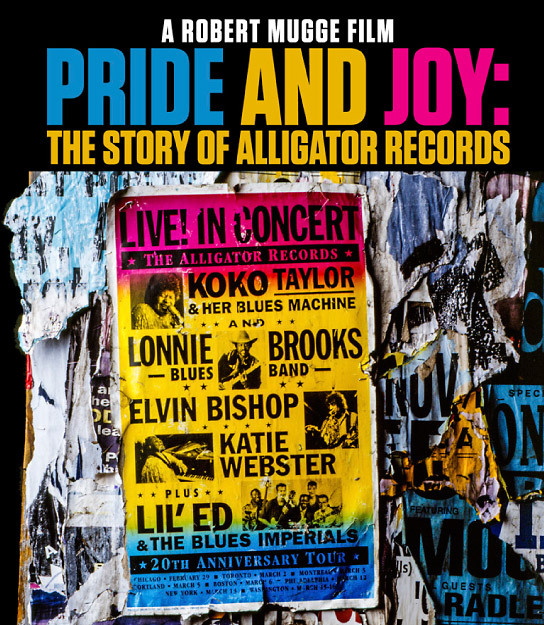 "PRIDE AND JOY: The Story of Alligator Records - Theatrical music docu by DEEP BLUES director Robert Mugge uses the March 1992 Alligator Records 20th Anniversary Tour concert at Philadelphia's Chestnut Cabaret as the hub for a fascinating look at the pivotal Chicago blues label. While Koko Taylor & Her Blues Machine, the Lonnie Brooks Blues Band, Elvin Bishop, Katie Webster, and Lil' Ed & Blues Imperials are uniformly dynamite, they are overshadowed by the near fairy tale of idealistic label head Bruce Iglauer, who came to Chicago out of college to hang out at the Southside blues bars and apprentice with legendary Delmark Records head Bob Koester before launching his own blues line - all for the love of the genre. 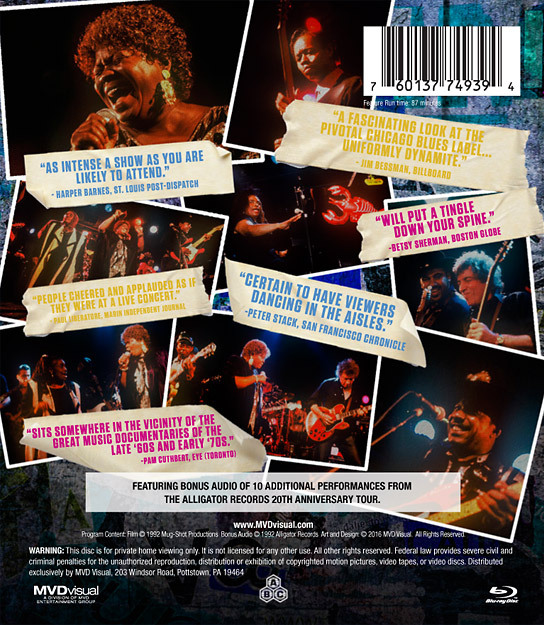 Beautifully captured too are the ups and downs of indie labeldom, as well as Iglauer's ever-articulate insights into the wonderful universality of the blues experience." to switch the cover at the left. 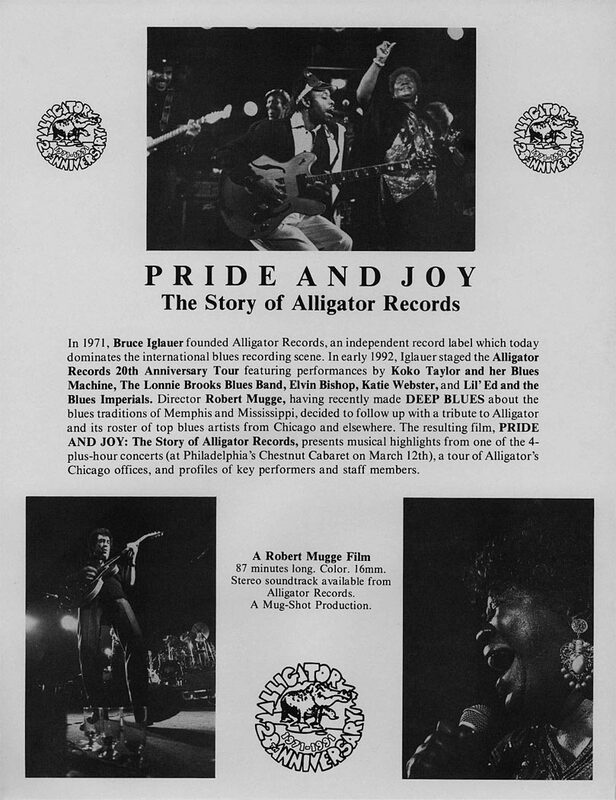 "Fans of blues who wailed along with director Robert Mugge's incisive documentary Deep Blues in 1991 have a new blues treat to bite into with Pride & Joy: The Story of Alligator Records, opening today at the Red Vic… Songs performed in the film include 'Wife for Tonight,' 'I'd Rather Go Blind,' 'I Want All My Money Back,' and a get-down jam rendition of 'Sweet Home Chicago' that is certain to have viewers dancing in the aisles."